Use Excel® 2013 VBA and Macros to automate virtually any routine task, and save yourself hours, days, maybe even weeks. Then, learn how to make Excel do things you thought were simply impossible! You’ll discover macro techniques you won’t find anywhere else and learn how to create automated reports that are amazingly powerful and useful. Bill Jelen and Tracy Syrstad show how to instantly... Read More about this publication. 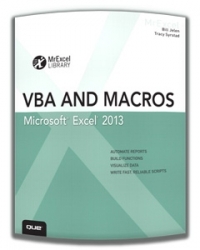 VBA and Macros: Microsoft Excel 2010 - The MrExcel Library.